Fried also says that the over-large donkey's eye in the background functions like a convex mirror.3 It is indeed like the mirror in the center of Van Eyck's Arnolfini Portrait or Velazquez's Las Meninas, though Fried makes no reference to them. 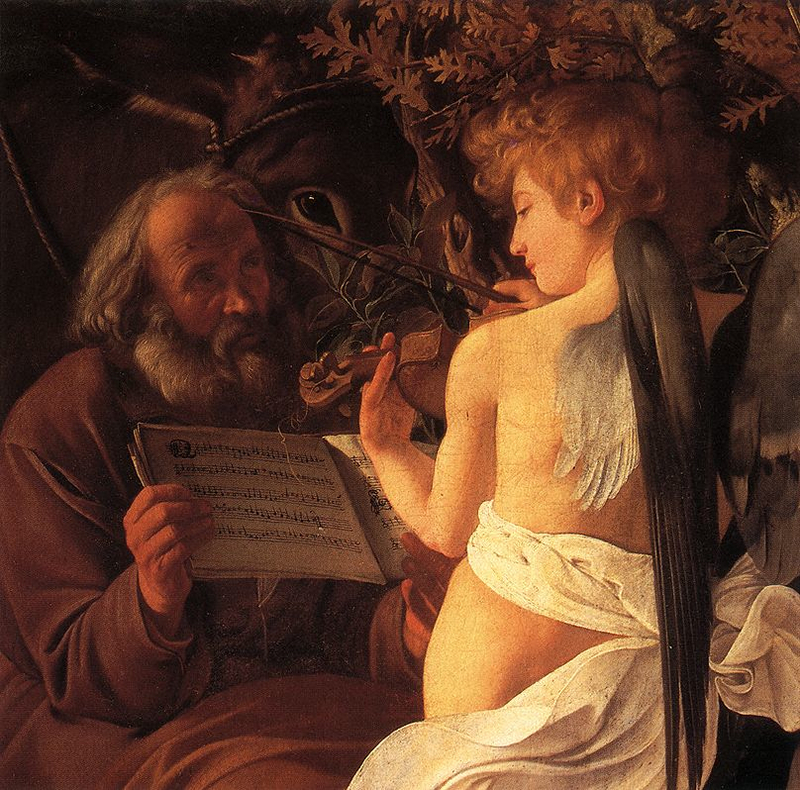 As symbols for the artist's vision, all three allow each composition to be understood as a mental image inside the artist's mind behind his eye which is why the bow of the angel's violin links the donkey's eye to the artist. 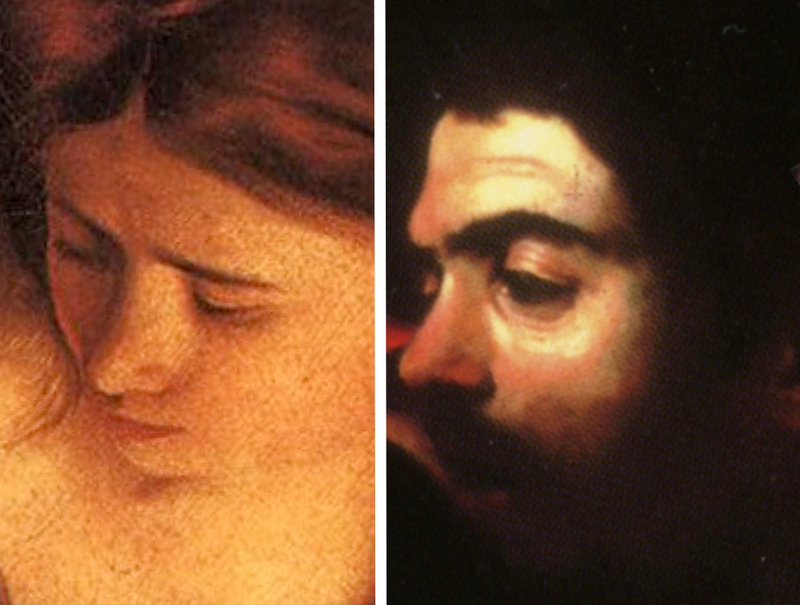 It has often been noted that the model for the Virgin is also Caravaggio's Penitent Magdalene.4 Hers is thus a familiar face in his art like Victorine Meurend's in Edouard Manet's, the link made more meaningful by the discovery that the contour of her nose and nostril is an exact match with that in Caravaggio's presumed self-portrait elsewhere. She is the feminine half of the artist's mind. 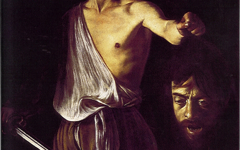 The meaning of Caravaggio's composition is obvious to those aware that every painter paints himself and even to eminent critics like Fried who think boldly and unconventionally. 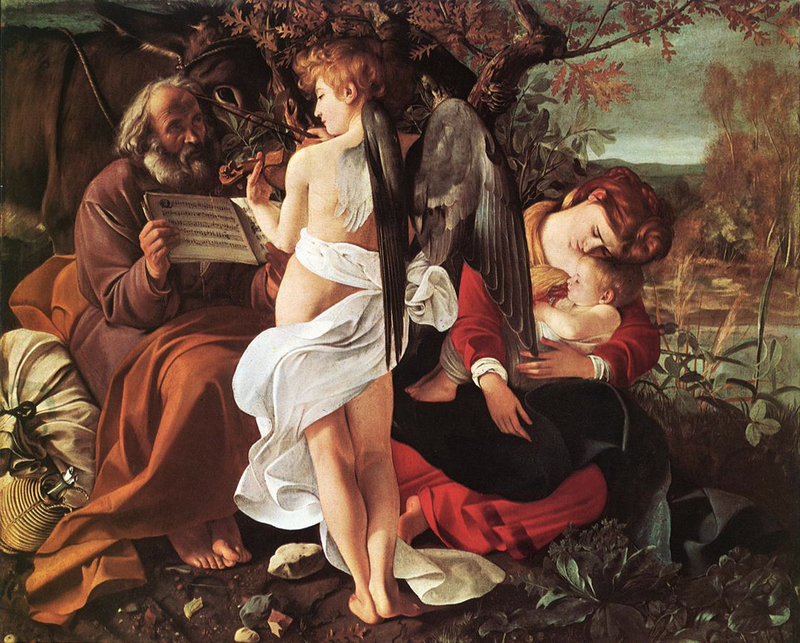 Besides, for at least two centuries earlier artists had used Joseph as their alter ego in many depictions of the Holy Family so his significance here, helping the angel and the artist follow his music, is fairly self-evident. 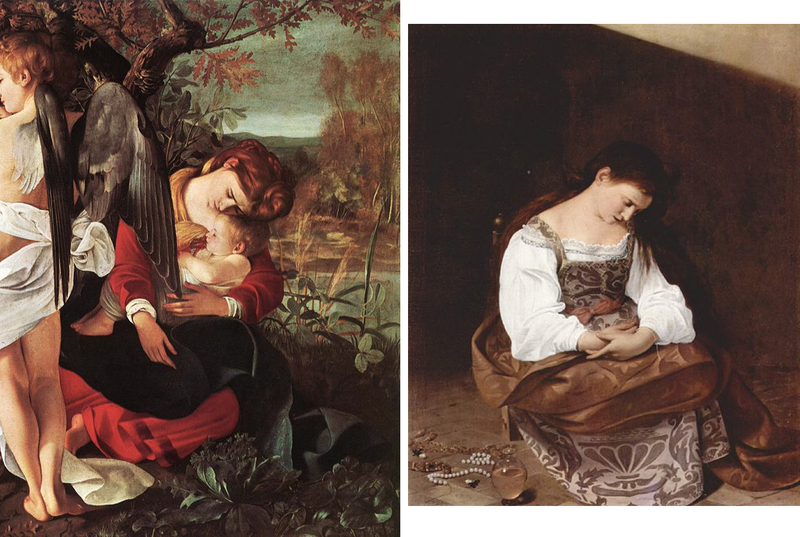 The Virgin's pose even recalls that of the Penitent Magdalene from a few years earlier (near left), the painting for which the same model is thought to have posed. 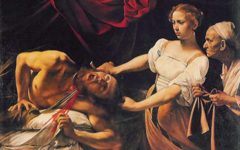 In both paintings the floor or ground veers sharply upwards as well as though we are looking at a flat, vertical painting. The bare floor in the Magdalene, reminiscent of a studio's, thus helps the viewer recognize that the "Virgin and Child", Western art's most iconic image, is in the later picture a "painting" within a painting. Although Fried was unaware of how often artists fused an outdoor scene with that of their studio, he still concluded that this painting expressed "the lived spatiality of its maker in the act of making – or perhaps I should say the lived spatiality of its maker as he was immersed in the act of making.”5 Fried's prose - and perhaps his thought - are never particularly clear and are often controversial but sometimes, as here, he can see what others cannot. 1. Matisse's Violinist at the Window (1918) depicts a figure, widely recognized as the artist himself, standing with his back to the viewer playing a violin. In front of him is a French window, the square window frames of which mimic a squared-up canvas. Original Publication Date on EPPH: 03 Apr 2012. © Simon Abrahams. Articles on this site are the copyright of Simon Abrahams. To use copyrighted material in print or other media for purposes beyond 'fair use', you must obtain permission from the copyright owner. Websites may link to this page without permission (please do) but may not reproduce the material on their own site without crediting Simon Abrahams and EPPH.